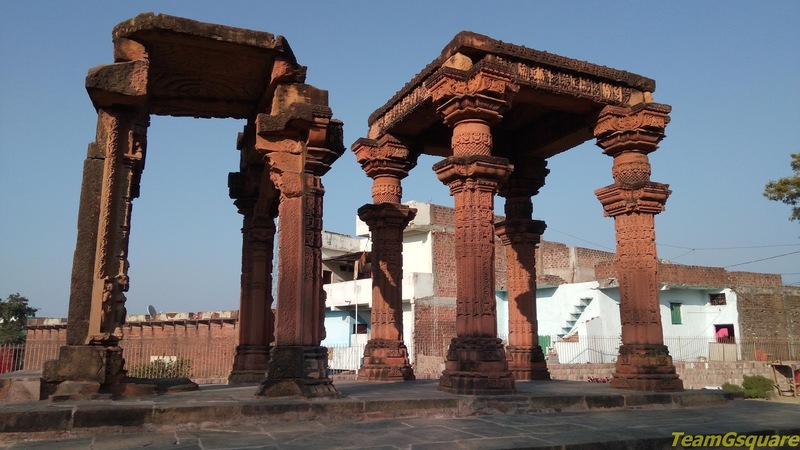 Gyaraspur is a small village located about 35 km from Vidisha and surely was on our list of places to visit in Madhya Pradesh. It took us about 40 minutes to reach this place from Vidisha, all thanks to the sign boards put up by Madhya Pradesh tourism. We headed directly to the 'Maladevi temple' situated on the edge of a cliff. We were greeted by an Egyptian Vulture that lay perched on the finial (kalasha) of the temple, giving us umpteen opportunities to capture him on camera. A gradual descent by steps brought us to the temple. The nature of construction of this temple is hybrid, being partly carved out of rock and partly structural. The temple is carved to perfection and the balconies seen on the sides of the mandapa are an interesting feature. The entry to the temple is restricted owing to safety concerns, though we could peep in to have a glimpse of the temple interiors. 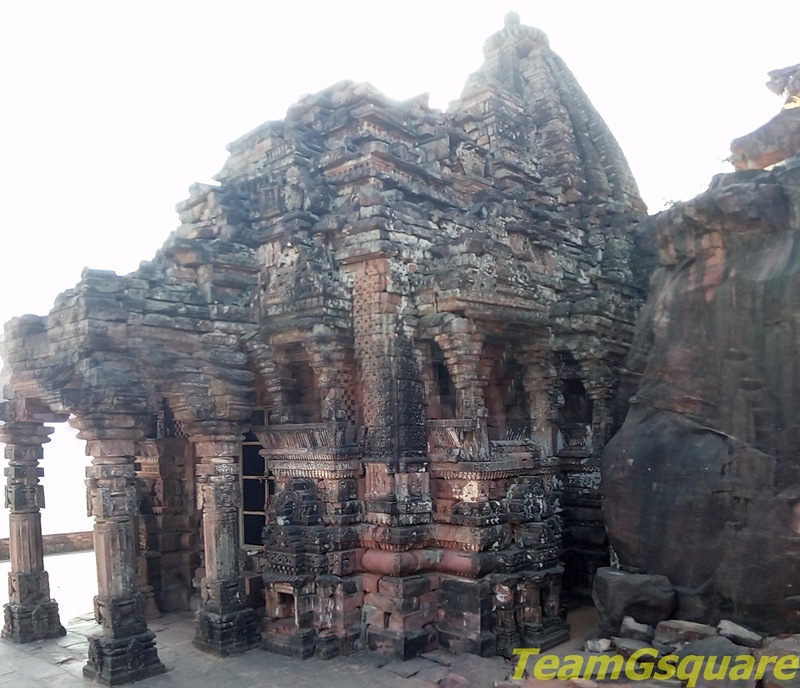 The temple by its outlook seems to be of Vaishnava origin, but later converted to a Jain temple. There are a few images of Jain tirthankaras kept inside the sanctum of the temple. This temple was built in the 10th century AD by Partihara kings. The only person we came across here was the temple care taker, who had maintained this place quite well. He was awestruck to know that we had come from so far to witness this beautiful place. He had a questionnaire session with us to which we answered patiently. He seemed happy at the end of our conversation and gave us more details with regards to places that are worth a visit around Gyaraspur. We thanked him and moved on to check out two other beautiful structures, the Hindola Torana and the Chaukhamba (four pillared hall) which are located about 1 km from the Maladevi temple. These places seem to be the remains of a large temple dedicated to Lord Vishnu. 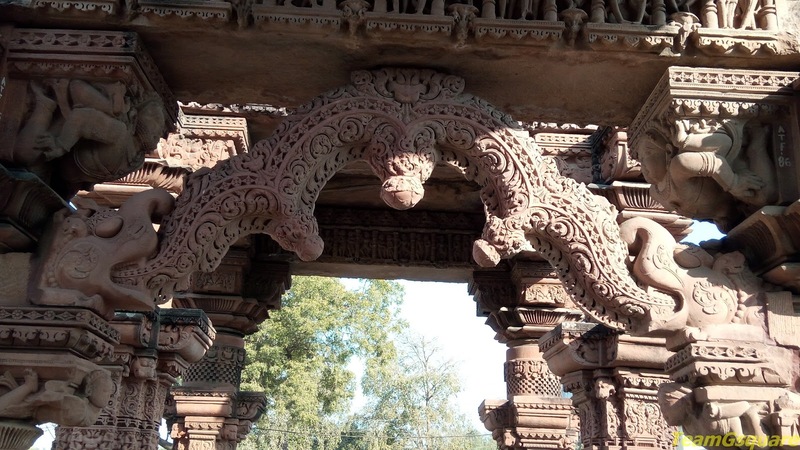 The 'Hindola Torana' or the 'Swinging Gateway' is an entrance gateway having two lofty pillars that support a double arched architrave. The pillars stand upright on a pedestal with its bases housing carvings that depict the ten incarnations or avatars of Lord Vishnu, of which the form of Lord Rama seems to be damaged beyond recognition. The arched architrave has been intricately carved with very minute detailing. A little further lies the four pillared hall or the Chaukhamba which probably was a part of the main temple. 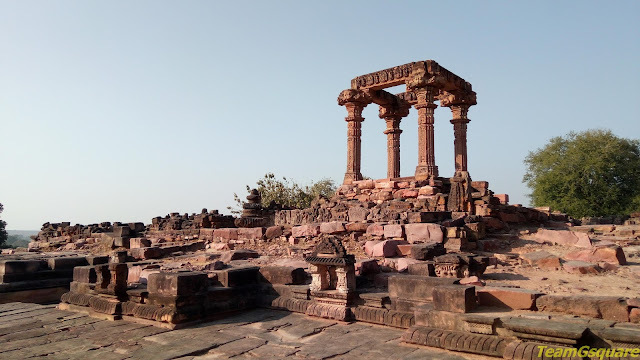 As we reached the main road, we sighted a board directing towards 'Ath Khamba' (a structure with eight pillars) and decided to visit this place too. 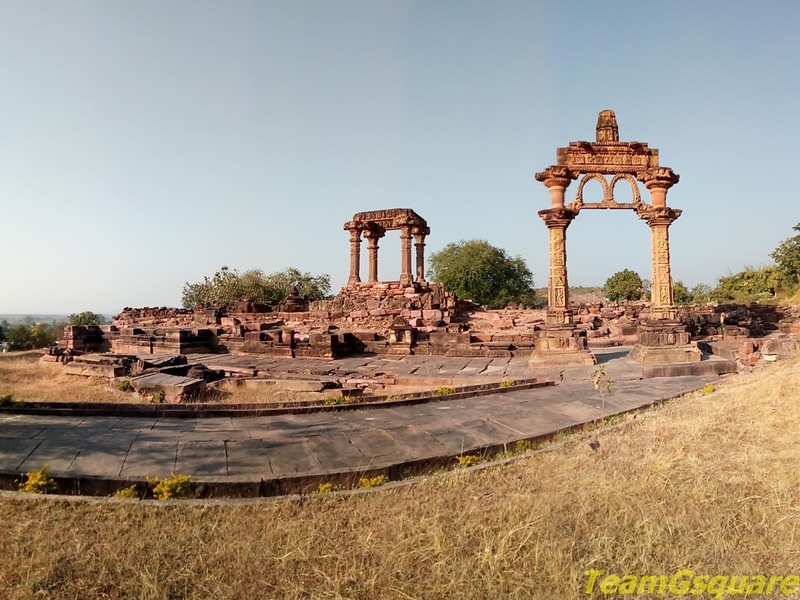 The structure was marvelous though in ruins, and originally may have been a big temple built in 9th century AD by the Chandela Prince Krishna as per the inscriptions found here. 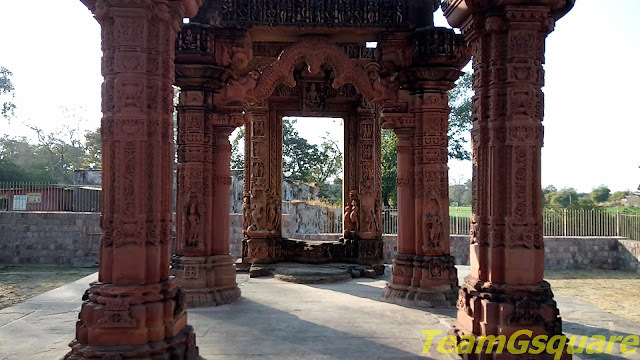 There is a beautiful Makara Torana with intricately carved pillars and door jambs. We missed visiting the Bajramatha temple and Dhaikinath Ki Stupa which are situated close by, as we had no information about them. 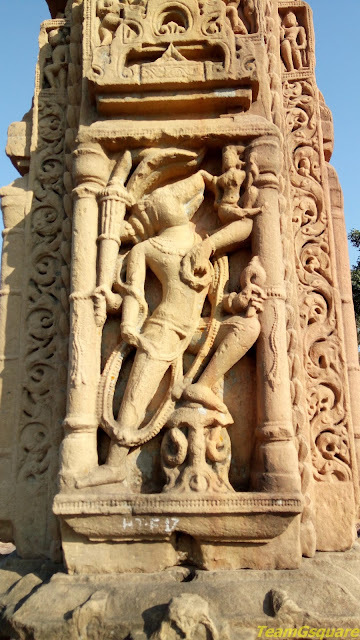 Varaha (3rd incarnation of Lord Vishnu) emerging from the Waters with the Earth (Bhudevi) on his Elbow. 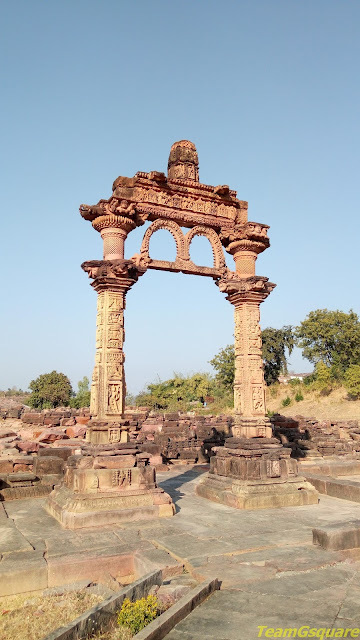 Distance from nearby major town: 35 km from Vidisha. Accommodation: There are no lodges in Gyaraspur, however, the closest and a better choice would be Gateway Retreat at Sanchi maintained by MPSTDC. Where to eat: There are a few small roadside eateries here. 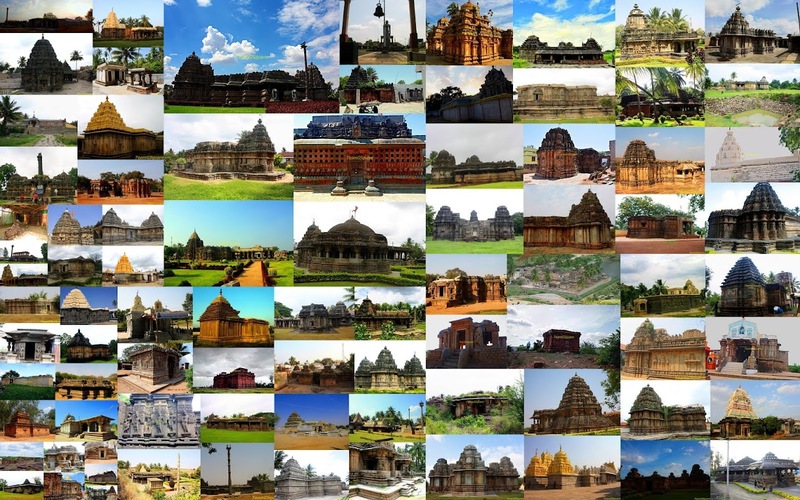 Wonderful monuments! You are doing a great journey. From last few posts you are mesmerizing me with some wonderful and magnificent places. This one is also awesome. Never heard about it. Thanks for sharing with lovely shots. Beautiful temple. There is lot to see here.